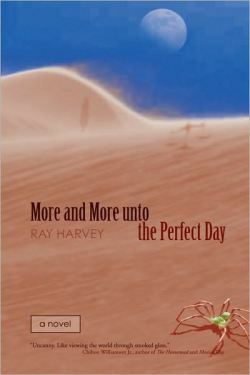 I finished reading Ray Harvey’s More and More unto the Perfect Day more than a year ago – for the third time. I had intended to write a review of the book immediately following each reading, but couldn’t gather my thoughts into a neat pile. Instead, I was left with crooked, overlapped, often torn conclusions of how the book had affected me. I have taken notes. I have made an outline in order to follow the storyline. I still find myself unable to write a standard type review, so instead, I’ll submit to my visceral reactions…as a human being; not as a writer, critic, or editor. First, it pissed me off because it attempted to challenge the beliefs that I have held dear for the entirety of my 38 years. For this, I commend it. A religious man’s faith is tested. The pages where this occurred in real-time are now filled with dry gorges — valleys that were formed by the weight of my tears. Old tears. Second, the crooked, yet parallel, line it draws with my own life had me looking over my shoulder with the turn of every page. From things as provocative and significant as sourceless anger and spontaneous illness to spooky similarities like Cherokee heritage, acne scars, stretch marks, the names and appearances of family members…I experienced what I would call a one-dimensional, reflective haunting. Here’s where I stop counting and fall into what flirts with a search for words. This book reached deep within in me. I am a deer that is not yet dead, but being prematurely field-dressed due to her poacher’s anxiety, guilt…something. A hand grabs at my trachea, cuts off the air, and pulls downward, to a place outside my own body. This book has found places within me that have been injured. Some of them have been healed. Others are now bleeding. I’m not a philosopher, and don’t wish to be. I’m not an intellectual, though I sometimes envy those who are. That’s why it’s so difficult to qualify how and why this book affected me so profoundly. I’m still not sure I understand all the material. Maybe I never will; maybe it’s not intended to be fully understood. I have found myself wishing I had never read it. Yet, I have read it numerous times. I have attempted to rid my mind of the images it imparts. Yet, I revisit them and curl up into the places they have hollowed out for me. Its lyrical prose is like a song. Its imagery is dark, shapely, and at times, far too real. Thank you, Mr. Harvey. I don’t know if you intended to do this to me, but it has been done. I doubt I will ever read another book like yours, but if one comes along, the will power to keep my hands off of it will have to be strong. Thank you for demonstrating how good literary fiction distracts the conscious mind while implanting belief systems into the subconscious and unconscious minds. You have reminded me why I love the written word and why I am addicted to its effects – even if those effects are those which I’d rather not endure. I strongly recommend this book to anyone who is NOT impressed by predictability, pedestrian prose, shallow characters, and ignorance as an ultimate form of contentedness. If you fit the profile, hold on. There’s no telling how deep this one will take you.